Tissue Donor Recruitment and Long-Term Outcome Following Tissue Transplantation. Sammelband (english) von Birgit Wulff, Klaus Püschel, Christian Braun, Theo de By, Roland Hetzer (eds. ), Verlag Dr. Kovač 2013, 82 S.
Tissue donation in Germany has to fight more hindrances than in other European memberstates: Though the German Tissue Act came into force 6 years ago we still have to state that the need for tissue grafts vastly overweighs the supply. 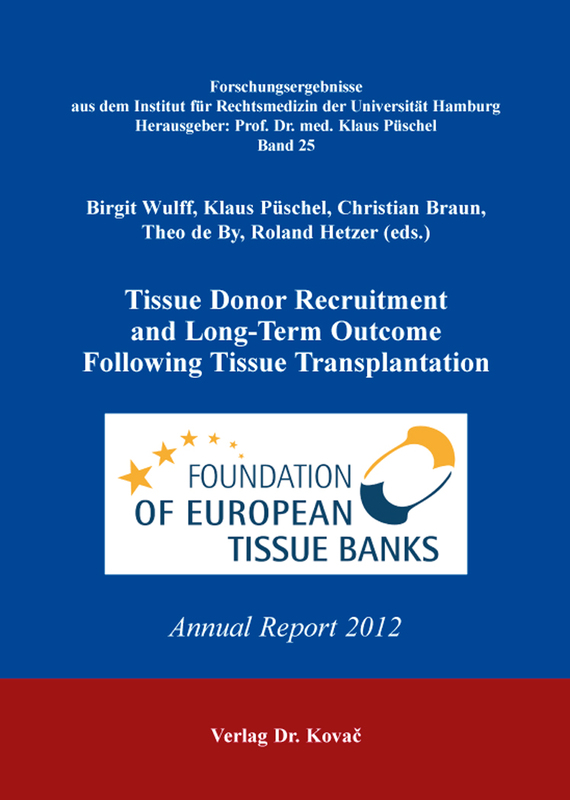 In this Annual Report 2012 of the Foundation of European Tissue Banks pathways from donor identification to successful transplantation are discussed within the European context in order to improve the German situation.